Open a Zerodha account with us to get a FREE Technical Analysis webinar + one month full-featured Investar intraday subscription combo (a Rs 4695 value). 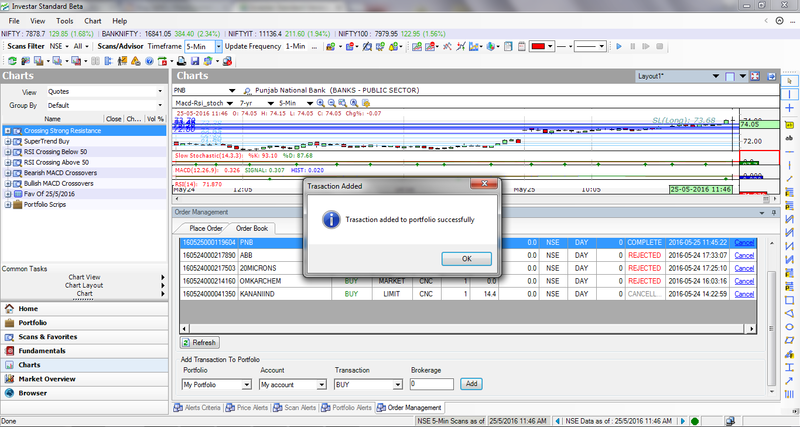 Right-click on an existing position in Portfolio Manager. Follow this quick tutorial on everything you need to know to get started on to trade directly in your Zerodha account. 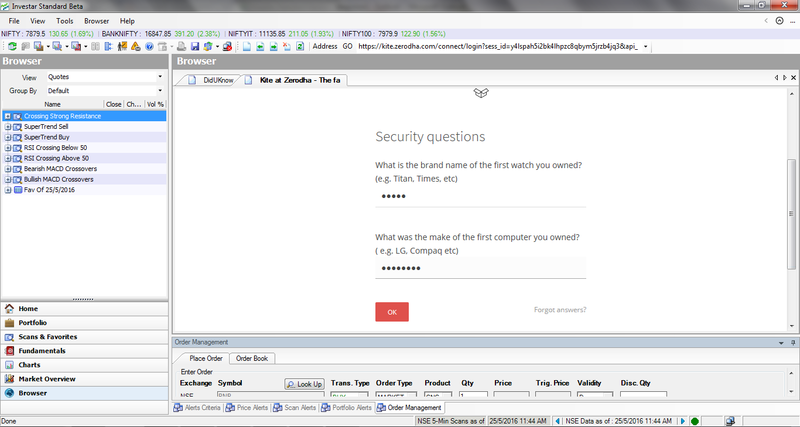 Step 1 : Login to Investar software and select the stock you want to place an order with. 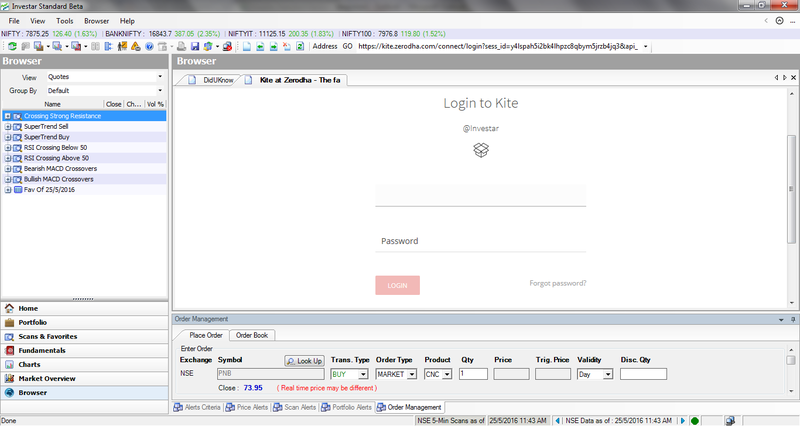 After placing an order, the Place Order tab in the Order Management window opens.The Order Book tab beside it helps you monitor/cancel/modify your orders. 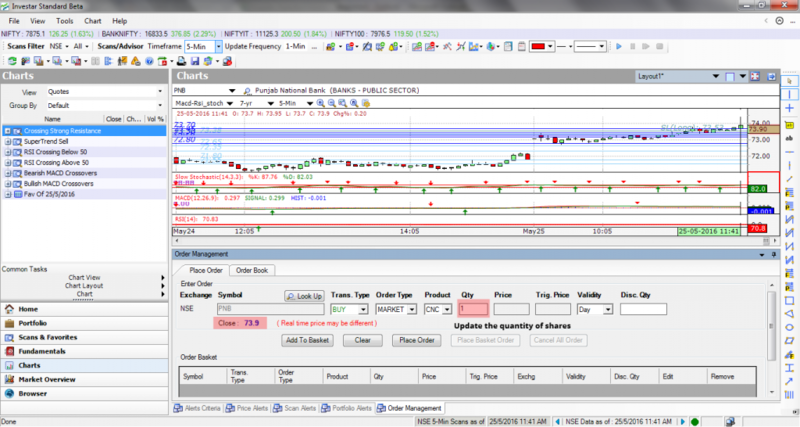 Exchange : It indicates which segment you are placing the orders i.e. NSE , NFO (NSE Futures & Options), BSE , MCX (Commodities). Transaction Type : It indicates the type of transaction your are placing i.e. Buy/Sell. 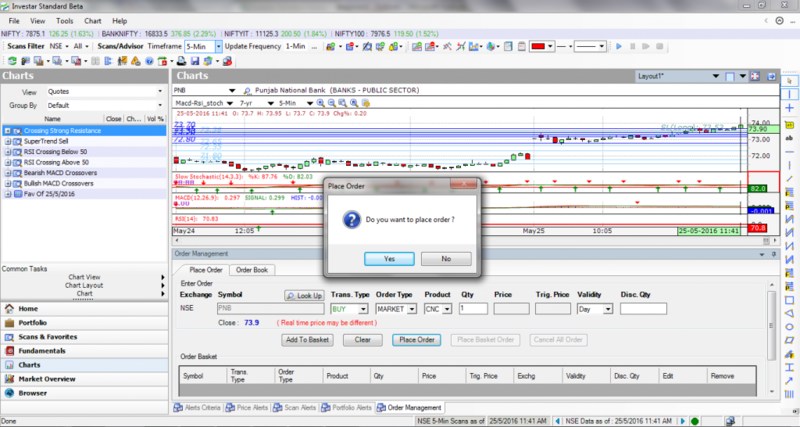 Order Type: The different order types Market order (where you buy/sell at market price),Limit order (where you specify the buy/sell price), Stop Loss Orders(SL – where your buy/sell order placed by you to limit the losses), Stop loss market (SL-M – where your order is sent to the exchange as a Market order). Product Type: CNC – stands for Cash and Carry, MIS -stands for Margin intraday square off. 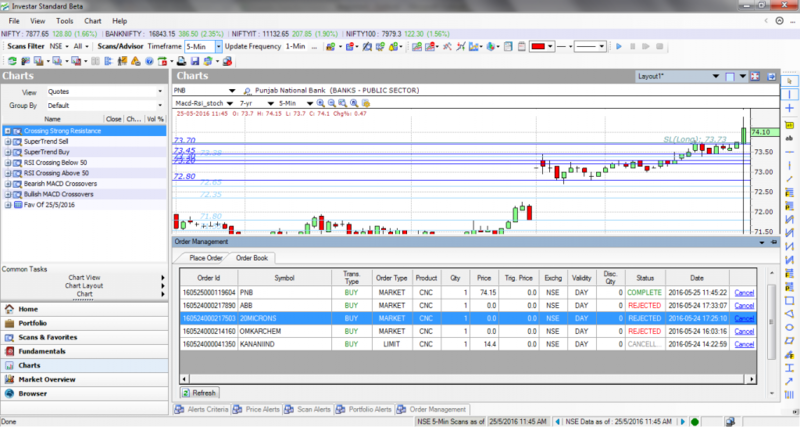 CNC product code is used for Delivery based trading of equity. 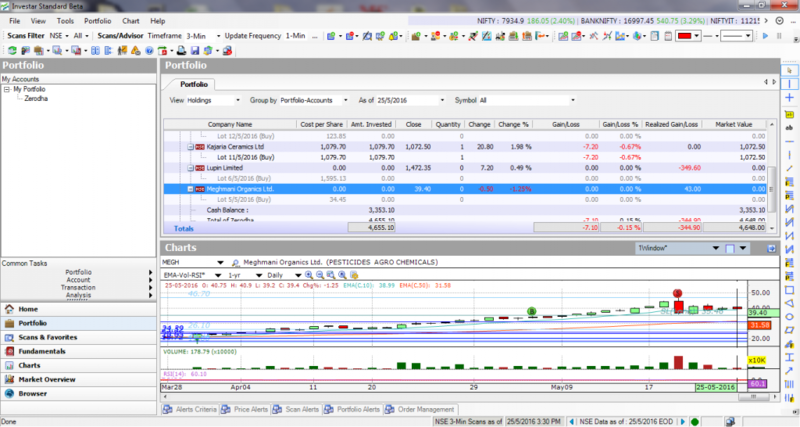 MIS product code is used for trading Intraday Equity, Intraday F&O and Intraday ,Commodity Trading. Qty: It indicates the Buy/Sell order Quantity. By default it is 1. You can change the default quantity. Price: You can only mention the price if your order is limit order or SL, if it is a market order or SL-M this field cannot be entered. Trig. Price: Trigger price will be used for Stop Loss orders. The price at which you need the stop loss to be activated. Validity: You get only 2 options, Day orders (valid till end of day) or IOC – Immediate or Cancel(request if not executed immediately will get cancelled). Disc Quantity: Only a part of the order quantity is disclosed to the market. If you are placing a big limit order and you don’t want the entire quantity to be disclosed you can choose Disclosed Quantity. Add to Basket: You can add multiple orders to your basket that hold the orders for you. Clear: It will clear your order. Place Order: Place an Order. 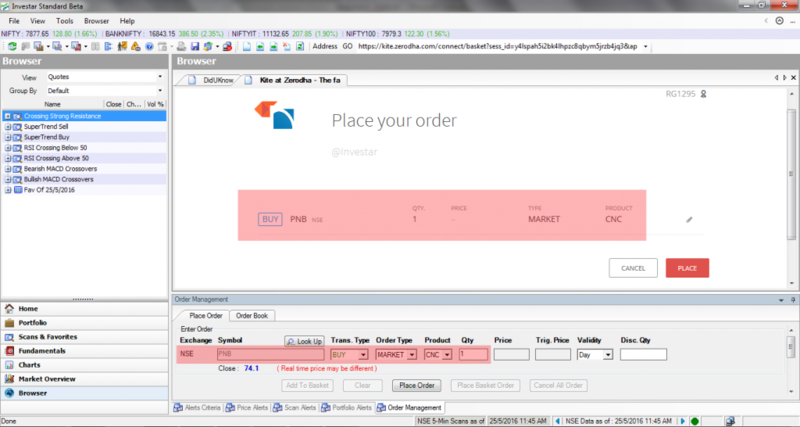 Step 2 : Once clicked on place order you will see the following Screen open in a new window which takes you to the Zerodha Kite interface. The process involves entering your valid Zerodha login credentials, and answering two security questions, the answers to which only you know (You only need to do this once a day!). 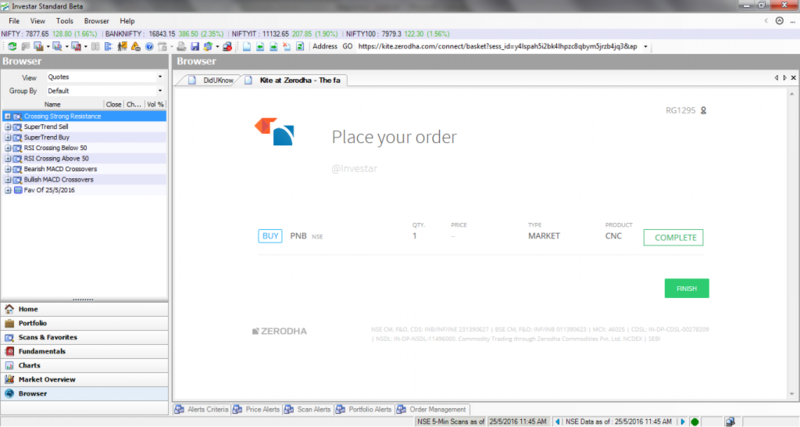 Step 3 : Once you login you can cross-check your order in Zerodha with Investar before finalizing your order. Once your order is submitted it cannot be modified in any way. click on “Finish” to confirm and place your order. Step 4 : After placing an order you can check the status of the same. The status will be COMPLETE if the order has been completed, or it can be REJECTED if your order has been rejected. Step 6 : After adding the transactions into our Portfolio Manager, you can even see the trades and charts together, making it very simple to visualize. Hopefully now you should be in a position to understand how to Trade from Investar into your Zerodha Account. Want to trade from Investar into your Zerodha account? This entry was posted in Investar and tagged Brokerage Savings, Happy Trading, Investar, online trading, Portfolio Manager, trade.zerodha. Bookmark the permalink. I have opened a Zerodha Account. Please provide a one month trial. Please contact +91-97250-10406 or send an email to support@investarindia.com to activate your offer. Only if you opened an account through us using this link. You can always take a free trial of our software . Zerodha trading through Investar is available Free for all Investar users.